If you want a cozy, air-conditioned villa with three bedrooms and harbor views, Prestige is perfect! It’s right in the heart of Gustavia, so you can easily explore the city. Walk to dinner, the club, or shops without traffic or fueling up your rental car. 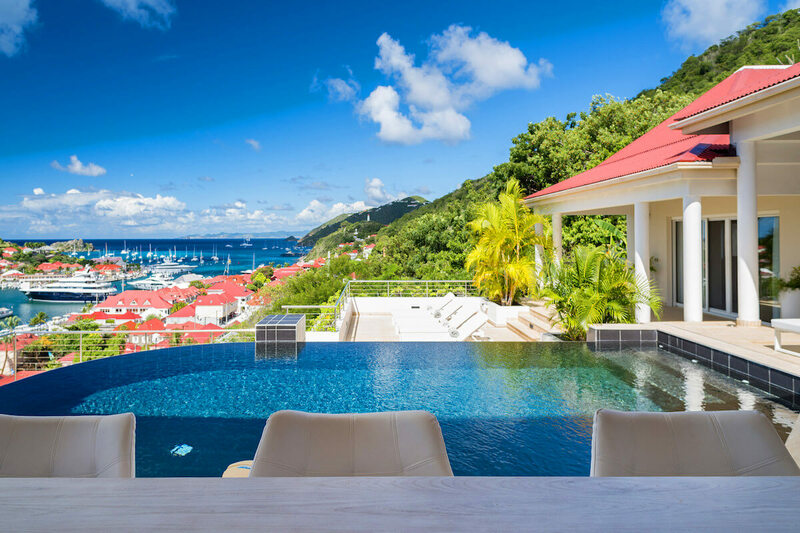 Prestige villa is a three-bedroom, fully air-conditioned home conveniently located on the hillside above Gustavia. This contemporary villa offers harbor, ocean, and sunset views from every room. Prestige’s large deck overlooks the harbor and ocean, with several places to relax. Guests can swim in the infinity pool, feast under the dining veranda, or lounge on the observation deck. The dining veranda opens to the expansive living room via collapsible doors, and has high ceilings with all-white decor. In the living room, a large, creamy sofa faces a flatscreen TV, stereo, and DVD player. Prestige villa is furnished in a tasteful, modern style with enough living space to accommodate six people. There’s a breakfast bar standing between the kitchen and the living room. The kitchen is equipped with stainless steel appliances, a coffeemaker, an espresso machine, an ice maker, and exterior access. Each of Prestige’s bedrooms has a flatscreen TV, DVD player, terrace access, and an ensuite bathroom. One suite has a queen bed and a small lounge, while the other two suites have king beds. Prestige villa is outside town, but is close enough for guests to walk to several restaurants and Gustavia’s downtown area. Housekeeping comes six days a week so guests can fully relax.